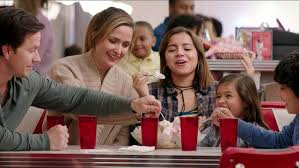 Instant Family is the charming, inspirational and humorous story of a DINK (double income no kids) couple who decide to foster three children. 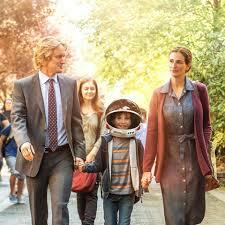 The film manages to be smart, brutally honest, funny and even whimsical all at the same time. Must see! BUT only for older teens and up for language and story content. AND IF YOU LIKE THESE REVIEWS PLEASE SUBSCRIBE! THEN YOU’LL GET EVERY NEW REVIEW SENT STRAIGHT TO YOUR E-MAIL!! GO TO THE BOTTOM OF THE LEFT HAND SIDE AND TYPE YOUR E-MAIL IN – IT (SHOULD BE) THAT EASY. ANY PROBLEMS PLEASE SEND ME A COMMENT AND I’LL DO MY BEST TO RESOLVE YOUR ISSUE. 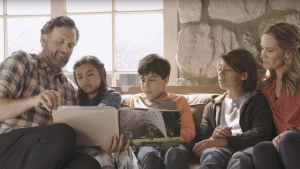 Instant Family COULD have been called Foster Parenting for Dummies. This is no one’s idealized version of a blended family. This is not The Brady Bunch, Three Men and a Baby, Despiccable Me or even……… The Blind Side (and you’ll see why that’s funny when you see the movie). 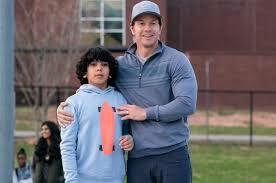 But the movie is honest and very funny, miraculously achieving that delicate balance between comedy and drama which many movies attempt but at which few succeed. The innate parity between laughter and tears, which exists in the human condition but is rarely found in movie scripts, comes naturally to this script because the story was inspired by writer/director Sean Anders and his wife’s real life experiences of adopting. All of the characters, from the kids to the support group members to the social workers, are based on the real people Anders met through the process – normally flawed humans with the usual awkward family dynamics trying to do their best under difficult circumstances.. 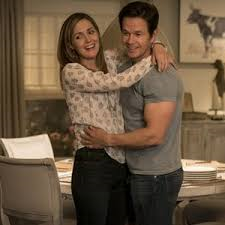 Instant Family soft pedals nothing as it follows Pete (Mark Wahlberg – Mile 22, Deep Water Horizon and Lone Survivor), and Ellie (Rose Byrne – Moira from the X-Men reboot and Bea from Peter Rabbit, and who, though from Australia, does a spotless American accent) from their naive, romantic visions of fostering a child, through the often hilarious mandatory support group meetings, the spotty support of their doubtful relatives, through the decision making and then to the realities of trying to support, protect, guide and raise three at-risk and traumatised children of different ages. Sounds like heavy stuff, and it is, but it is also laugh-out-loud funny. 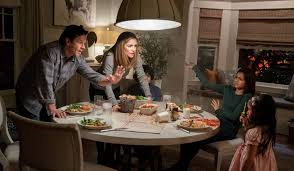 The movie occasionally wanders gently into slapstick and slight caricature but only in a way one might, with the humor and affection gleaned from the wisdom of retrospection, remember an experience that did not seem funny at the time but ends up being one of your favorite memories. 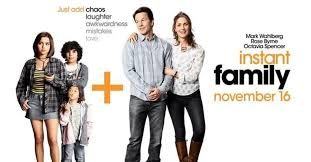 Instant Family reminds me a lot of last year’s equally brilliant Wonder, about a family coping with a severely handicapped child. There are no bad guys, only the challenge, tackled by adults and children alike, to interact with the people who love you as best you can. 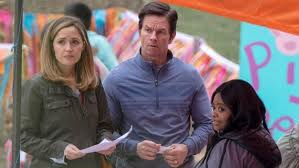 And if you ever wondered, as the PSA querries, that you had to be perfect to foster a child, the characters in Instant Family will disabuse you of that notion pretty quickly. 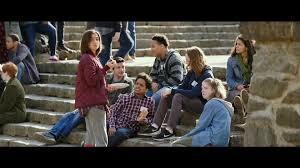 The support group scenes are especially funny, populated, as they are, by every possible combination of would be foster parents, from: single wanna-be super mom, to idealistic fundamentalist Christians, to an infertile interracial couple, to a gay couple, and to our protagonists – an upwardly mobile self employed couple, who initially think of these children the way they do the houses they renovate for a living. All come with a unique set of priorities and preconceived, often conflicting, sometimes counter-intuitive notions. Some are even portrayed as ridiculous or annoying. But, fundamentally, ALL of them have one thing in common: A core desire to provide a loving stable home for children who have none, and who are often at risk of abuse, addiction and even death at the hands of their biological parents and the environment to which they are subjected. These foster parents, for all of their differences, flaws, quirks, and even errors in judgment, are the living life rafts on the treacherous and stormy seas of our broken culture, desperately trying to rescue survivors who sometimes don’t even want to be saved. I love movies about: The Avengers, Thor, Hulk, Spiderman, Iron Man, Superman, Wonder Woman, Ant Man, Batman, Justice League and Agents of SHIELD. 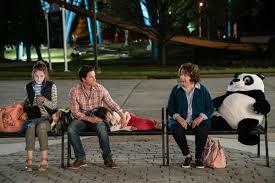 But these disparate, sometimes awkward, occasionally clueless foster parents are the true super heroes. The acting is terrific, never succumbing to the easy temptation to sink into saccharine or false empathy, but neither does it avoid showing the warts of the torturous foster process. Wahlberg and Byrne are excellent and never shy away from any of the very strong emotions of the moment, but don’t dwell on them either. And there is a constant balance of the solemn with the naturally evolving moments of humor that always arise from even the grimmest of circumstances. 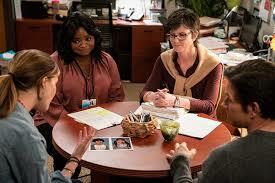 For example, the social workers, Sharon and Karen, played by Tig Notaro and Octavia Spencer (Hidden Figures and Zootopia) are very funny as odd couple co-workers. Notaro is the prim, proper, white, reserved, rule follower while Spencer is the outspoken, blunt, pragmatic, black counterpart. But they both have a realistic view of their jobs. When Pete asks Sharon and Karen about the foster children’s father the only answer he gets is uncontrolled laughter. This humorously speaks serious volumes without belaboring the tragic point. 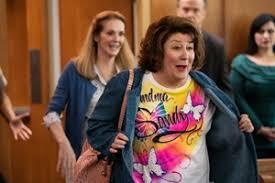 In another scene, after learning of a significant hitch in their plans, Pete and Ellie come home to discover Ellie’s mother, Jan, being decorated with permanent ink sharpies. There was no malice involved. Children and Jan alike had mistaken them for washables. 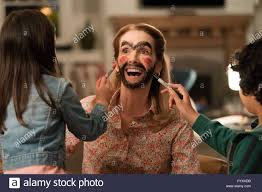 Jan, performed by Julie Hagerty, whose unforgettable stint in Airplane made her synonymnous with ditzy characters, solemnly offers good and sage advice but, of necessity, while indelibly and distractingly face painted. The music is a cheerful and delightful sprinkling of songs like Wings’ “Let ’em In,” George Harrison’s “What is Life,” and Jefferson Starship’s “Nothing’s Gonna Stop us Now”. The perky upbeats also help soften the more somber moments. You can get the individual songs streaming on Amazon here. The children are very natural. 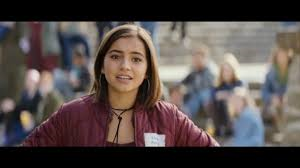 Isabela Moner, singer and actress, is Lizzy, the teenager who is simultaneously grateful for the safe haven Pete and Ellie provide for herself and her siblings and understandably resentful of these same people as interlopers to her “real,” incarcerated, drug-addicted mother. 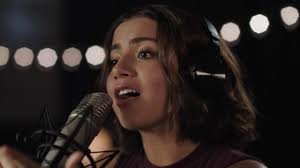 Moner has a truly beautiful voice and sings the credit song, “I’ll Stay,” at the end of the movie. Gustavo Quiroz is adorable as Lizzy’s clutzy, well meaning and inept younger brother, Juan. And Julianna Gamiz is the youngest and precocious sister, Lita. The two younger kids act with the normal and very believable open ingenuousness, quick impulsive affection, manipulative behavior, and selfish temper tantrum demands of normal kids. But the writing skillfully runs a thread of abnormality underneath these kids’ otherwise normal veneer. For example, Lita happily plays with Ellie when they first meet until Lita begins play-acting with her doll, calling her doll racial epithets and interacting with the doll in ways she is obviously imitating from her previous foster parents. It’s nothing sinister but casually cruel. And it gives the audience a taste of what every precarious day can be like for these kids whose parents have abysmally let them down and are in a system which can sometimes fail them. But again the serious tone is undercut by the humorous way the failed foster couple insist she must have heard it on TV. 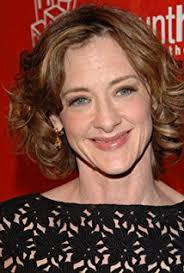 A lovely cameo is of Joan Cusack as an elderly, awkward, but concerned neighbor who helps to deflate another scene which could have degenerated into mawkishness but for her delightfully eccentric presence. 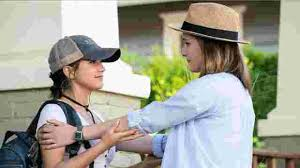 The filming style itself is very straightforward, almost like professionally made home movies, as we see quite intimate moments of Ellie and Pete with each other, with their families, and with the foster kids, and the support group sessions. While there is no sexuality shown on screen, there are sexual topics which come up necessarily and inevitably with the raising of a 15 year old girl from a bleakly broken background who has severe daddy issues. In addition, under stress, there is some humorously interjected but understandable profanity that crops up sprinkled throughout the movie. 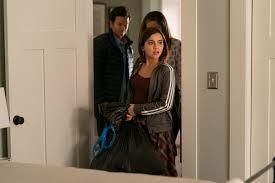 This, with the serious topic of abandoned and at-risk children, make this movie suitable only for older teens and up. However for that demographic for which is appropriate it is a must-see movie.